I am very grateful to announce that Olga Bolart now is our Selected Promessa Representative in Spain. Olga Bolart is the suitable partner for our promession® concept in Spain. Olga was one of the first persons who received the Promessa Masterclass Education in Sweden and she is very knowledgeable in the burial and incineration’s sector from a traditional and innovating point of view. Olga says: “The past 5 decades we have been living unconscious regarding the consequences of our actions. Now we all see/suffer from the result. Up to 76% of Spanish people believe that climate change is a very important issue that deserves more attention. This percentage of people are willing to take actions today in order to reduce or eliminate their carbon footprint on our planet. These people are looking for Promessa because you do not pollute, youwill be a gift back to nature”. Promession is an environmentally friendly method developed to take careof human bodies after death. The concept focuses on letting nature’s preferred method of aerobic decomposition take place. This avoids the creation of methane gas and pollution of groundwater, which are environmentally problems with traditional burials. For those who prefer ashes and cremation, Promessa has also developed a cleancremation method which releases significantly less pollutants, like furans, NOx and Dioxins. Promessa can also guarantee Zero Mercury release, which is impossible with the existing methods of today. Spain is suffering from the same problems as the death care industry is experiencing around the world and Promessa as an organization is looking forward to be a solution to these problems, and at the same time introduce appealing options to the people of Spain. Promessa continues to receive interest from countries around the world, today 97 countries and we look forward to announce more partners as they have been Educated. Promessa is a Swedish company which has developed and offers the environmentally friendly and ecological funeral concept of promession®. Promession solves the pressing issues in the death care industry of unsustainable land usage and pollutionof our vital resources; soil, water and air. Private persons around the world find that Promessa is offering important and appealing solutions to a topic that concernsall of us. 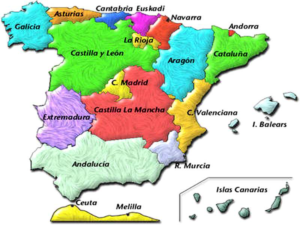 Map of Spain showing the 17 “Comunidades Autonómicas”.